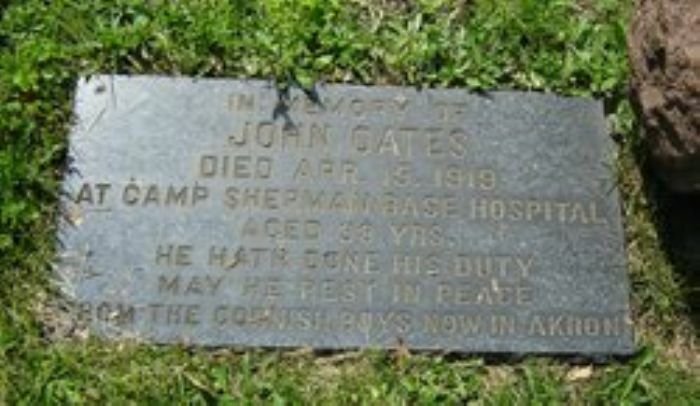 John Oates died at Camp Sherman, Ohio, on April 15 1919, he had just returned from Europe where he been serving in the 112th Engineers. The names of the 38 soldiers and sailors who from the Parish of St Just in Penwith gave their lives for their king and country are depicted in the Memorial Window, but that can hardly be regarded as sufficient. Unless their identity is determined and recorded more fully, and at once, it is not unlikely that in a few years, when enquiry is made for particulars respecting them, it will be made in vain. In the following notes it is attempted to supply such information as may serve to indicate who they were and where they were killed. John Oates was the son of Mr Richard Oates and his wife Elizabeth (nee Eddy). He joined the U.S. Expeditionary Force as a private in the 112th Engineers and died before demobilisation at Sherman camp, at the age of 32 years. His parents – a brother and two sisters – live at St Just, where he was born. John Oates is relatively easy to identify because of the foresight of the people who compiled the St Just Book of Remembrance with the specific aim of preserving not just the names of the fallen but who they were. Ironically it is now those who survived and returned to St Just who prove to be difficult to identify. But we don't have that problem with John Oates and from the simple details provided we can add detail to his life story. He was the second son of Richard and Elizabeth and was baptised in a Bible Christian ceremony in St Just Vestry on 22 December 1887. His older brother Richard was born two years earlier and his sister Elizabeth was born a year after John. The 1911 census indicates that John's mother, Elizabeth, had given birth to 12 children, two of whom had died, and it's clear from other sources that these children were all born between 1885 and 1902. In 1911 the family lived in South Place in St Just. In August 1911 John's sister, Elizabeth, married Hermon Roberts of Penzance and in June 1913 Hermon is recorded as passing through Blake's Star Hotel in New York on his way to Akron. He seems to have travelled alone and at some point in the next few years Elizabeth joined him and they set up home at 1676 Preston Avenue, Akron. In December 1914 John himself left Cornwall and travelled to Liverpool where he boarded the S.S Adriatic and in January 1915 his name appeared in the Cornish Folk in New York column of the Cornishman, he was en route for Akron. The 1911 census gives John's occupation as tin dresser but does not say where. He did not work at Levant, the only John Oats (there are no Oates) in the 1914 wages book also appeared in 1915, so one wonders whether he had been working at Botallack where the pumps had been lifted earlier in the year (see On This Day 14 March 1914). Some surface workers must have been kept on until the autumn as Botallack continued to sell product. Be that as it may, John Oates followed the path of many Cornishmen before him and made for America and by 1917 he was working for Goodyear as a rubber worker. John enlisted at Akron on 27 April 1918 and shortly after this, on 29 May 1918, he became a US citizen. Initially he was placed in B Company of the 316 Infantry but on 28 May 1918 he was transferred to B Company 112th Engineers, part of the US Expeditionary Force. His papers describe him as a short man of medium build with black hair and brown eyes. He is single, next of kin his father and date of birth is given as 3 June 1886 in St Just. His naturalisation papers give his date of birth as 3 June 1888 but all other evidence points to 3 June 1887, six months before his baptism. 2709131 Pvt John Oates served served in Europe from 23 June 1918. His unit was involved in the Scheldt river crossing just prior to the Armistice where their task was to construct a bridge to replace those blown up by the retreating German Army. German defensive fire power presented them with a problem which was eventually solved when Joe Smithhisler swam the river, took notes of the enemy emplacements and swam back, mostly under water to avoid being shot by the alerted enemy. With his notes the artillery were able to knock out the German guns and the 112th were able to build their bridge. John Oates would have been present at this action. The 112th were back in the United States by 3 April 1919. With time on his hands while awaiting demob, John Oates took the opportunity to go to Akron to visit his sister. Following the visit he rejoined his regiment, who were due to parade in Columbus before heading to Sherman Camp for demob. But before these events could occur he was stricken with appendicitis and died, his remains being delivered to the home of his sister in Akron from where he was buried in Glendale Cemetery. A long account on John's funeral appeared in the Cornishman of 4 June 1919 under the heading “Cornish Funeral at Akron, USA”.